Kicevo is settled in the valley of Kicevo in the south-eastern foothills of Bistra mountain, almost exactly in the middle on the road between Ohrid (61 km) and Gostivar (46 km). From the capital Skopje is 112 km away. It's location is in the western part of Macedonia. Kicevo is surrounded by mountains and forests, and is a town that is attractive not only of its natural beauties, but also its anthropogeneous and cultural values. Kicevo was first time mentioned as Uskana during the rule of the ancient Macedonian kings Perseius and connected with the Macedonian - Roman Wars, in 170-169 BC. Later it is mentioned in the year 1018 AD, under the name of Kicavis, noted in one of the documents of the Byzantine emperor Basil II. It is presumed that the today's name of the town originates by the name of this settlement populated by the Slavic tribe Brsjaci. 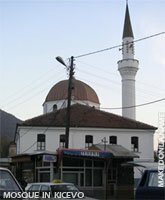 As Macedonia falls under Turkish rule, Kicevo was turned into military and administrative center of the Ottoman Turks. In the foothills of the Kale of Kicevo, there was a clock tower built. The first roots of the work of the Macedonian Revolutionary Movement, here in Kicevo started with the priest Yoseph of the monastery St. Bogorodica Precista (Holy Virgin Mary Most Innocent) and by many teachers. Here in 1878, by Pere Toshev was formed the first armed detachment, lead by Duko Tasev. The Kicevo citizens here in August 2nd, 1903, joined the struggle for independence of Macedonia, lead by the duke Arso and Yordan Piperkata. Later in the second world war Kicevo was occupied by the faschists Italian forces and it was the first city in Macedonia that was liberated, on September 11th, 1943. Today Kicevo, is one of the most beatiful cities in Macedonia, and has 25,129 inhabitans (Macedonians, Albanians, Turks, Serbs, Gypsies). 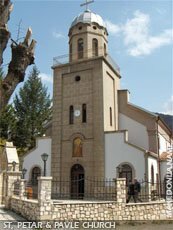 In the vicinity of Kicevo, on the slopes of the mountain Vrboj, in the dense forest, the monastery St. Precista (Holy Virgin Mary Most Innocent) is located, with its church dedicated to the Annunciation, and with the pleasantly arranged lodgings where there is active monks life. The St. Precista Kicevska is a medieval monastery that was known under the name Krninski monastery in the past.